Why another method for center-started knitting? Knitters complain that starting from the middle is fiddly, that their needles fall out, that tension is difficult to maintain. Yes, this is all true. Nevertheless, there are lots of good reasons to start projects from the center. A center-started hat can be tried to check the length as you go. The concentric rings of lace in a center-started shawl are beautiful. Umbilical cords are simple--no needles will fall out--yet the end result is identical in looks and structure to the lovely, yet fiddly, disappearing loop. Belly buttons start with an "umbilical cord" of waste yarn which is later removed. The cord gives you something to hang onto, making knitting easier. Once removed, you get a neat little rosette of stitches--the "belly button." All the beauty points of disappearing loop but far easier. To make the umilical cord, you have two choices. Either you can follow the waste-tube method shown here. (Follow steps 1-8) or, an even easier way to start the little tube with I-cord from a mill. Same idea, only the I-cord mill makes the umbilical cord. Once you have the umbilical cord made by whatever method, divide the loops evenly onto two dpn's. If you made the umbilical cord yourself, you will have the right number of stitches for your starting round of garment yarn. If you are using I-cord from a mill (4 sts) then cut that yarn long, and follow the below instructions to knit increases into the first few rounds of the I cord, using the I-cord yarn. Once your umbilical cord has been increased to the correct number of stitches, you switch to the garment yarn. With the stitches divided onto 2 dpn's, and holding the tube flat (both dpn's held in the L hand, but only knitting off the front one), knit a row--in garment yarn if you made your own umbilical cord--in umbilical cord yarn if you did not. Flip the dpn's over and knit another row. One round knit. 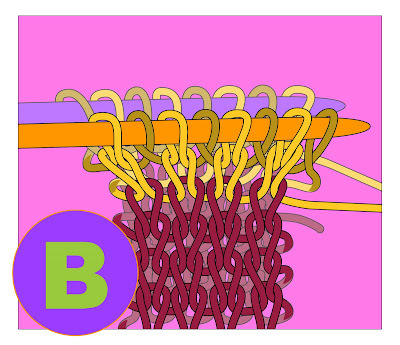 Illustration A, below, shows the umbilical cord which already has one round (ie: a front and a back row) of garment yarn attached. 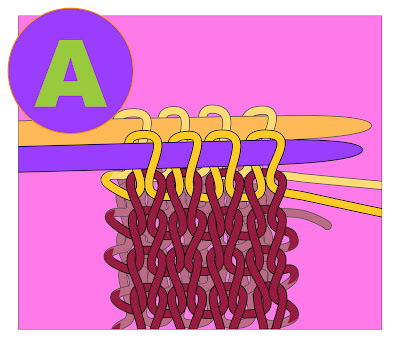 The second round of garment yarn as an increase round, and this is shown in illustration B. The increase stitches are colored darker--in real life, of course, they'd be the same color as the other stitches. Illustrated here is a backwards loop increase, but really, any sort of an increase could be put into this second round. Many center-started flat objects feature an alternating two-round plan: First, a plain round, where there are no increases, then this is followed by a second round, an "increase round" where the increasing takes place. This is the plan we are following here. Illustration A shows the plain (non-increase) round, while illustration B shows the increase round. 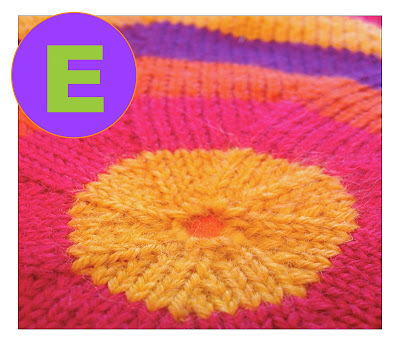 Center started non-flat objects (hats, mittens) use the same idea, but put more plain rounds between the increase rounds. Illustration C shows flat knitting increases repeated several more times: increase rounds alternating with plain rounds. If you're working with I cord from a mill, once you have the correct number of stitches increased, you switch to the garment yarn. After only a few rounds, there will be lots of stitches, ready to pop off the dpn's. 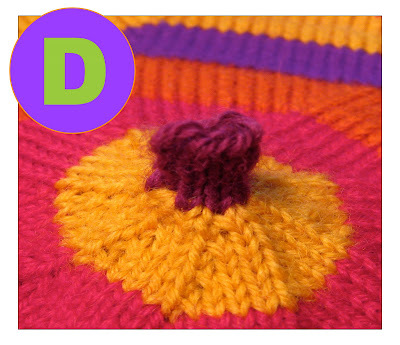 Rearrange your work either by the magic loop method onto a long circular needle, or add another dpn or two, so that you are knitting with 4 or 5 dpn's. It's easier to flip the work over so the belly button is up and the needles are down: gives a better view of what you're doing. After the tapestry needle has been passed though all the live garment stitches, the needle is again passed through the first stitch-loop (and only the first stitch-loop) to prevent a gap from forming. The yarn is then drawn up s-l-o-w-l-y to prevent knotting, until all the stitches are snugged up into a center rosette of stitches. This makes the belly button. Alternatively, you can make an attractive little hole in the middle of your work by not pulling the yarn up all the way when you snug up (photo below). 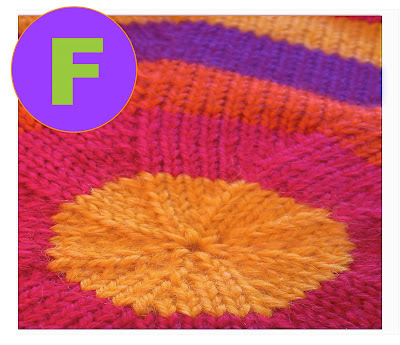 In illustration C, we made the belly button after knitting only a few rounds in garment yarn. This is a good idea, especially the first few times you do this trick--if you mess up, you haven't lost much work and it's painless to start again.To get a better picture of the process, however, illustration D shows what the belly button would look like if you postponed surgery until some way into the project. Because the cord is taking up quite a bit of room, the fabric is humped up into a kind of a cone in the center. Never fear--when the umbilical cord is removed, the fabric will lay far flatter. Illustration E shows the umbilical cord removed but the belly button in this picture has not been snugged completely: there's a little open-work circle in the middle--very pretty for lace. Illustration F, below, shows the same fabric with the belly button snugged up all the way. The umbilical cord here shows 8 stitches cast on with an increase of 8 stitches every second round. This is the default formula for a flat circle. However, umbilical cord works for any number of stitches cast on and any rate of increase. Match the number of umbilical cord stitches to the number of stitches you are supposed to cast on for your pattern, and away you go. ADDENDUM: Due to not googling before chosing this name, it turns out that Rosemarie Buchanan, the inventive author of "Two sticks and some string!" has a prior claim to this name for this technique. I urge you to have a look--Rosemarie's umbilical cords are made a bit differently, using a flat-knit umbilical cord, then going to 4 dpn's right away, and her method is worth knowing, too. Click here for a direct link to Rosemarie's post on this matter. You have been reading TECHknitting on "the umbilical cord waste yarn method for center-started garments, or 'how to make knitted belly buttons.'"